We loved welcoming you to our Christmas services last year. 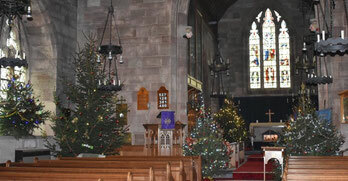 Our Christmas Tree Festival was a sight to behold – 30 trees in Shustoke church, each one sponsored and decorated by local families or organisations. There were also amazing Christmas cakes from all around the world! We had three carol services; unfortunately Lea Marston’s service couldn’t go ahead because of the ice but the community choir joined us at Nether Whitacre instead which was a wonderful blessing. We celebrated after with mulled wine and mince pies. It was standing room only in Shustoke as we sang by candlelight, Andrew and the community choir offered us a very special night to remember. The daytime carol service in Over Whitacre was a beautiful service in a very peaceful church, followed by mulled wine again of course! 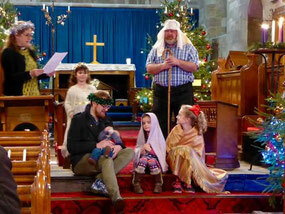 The Christingle Nativity on Christmas Eve was great fun. We were all offered halos or crowns to wear throughout the service. We told the story of Jesus’ birth using people from the congregation – Mary, Joseph, Jesus, the star, angels, shepherds and kings all gave a stunning performance! I was lucky enough to join Shustoke School to see their Nativity and Carol Service. What talented children they all are! They tell the Nativity story with joy and wonderment. I was amazed at how well they remembered their words. Finally, Midnight Mass and Christmas Day gave us the opportunity to celebrate God with us. I’d like to thank everyone who helped to make all these services possible and also to you for joining us! We hope you all have a blessed 2018.